Invasive species are a threat to our native wildlife. Some harbour disease, others compete with the locals for food and other resources, and still others predate on indigenous species. The harlequin ladybird (Harmonia axyridis) originates in Asia. It was first recorded in south east England in 2004 (in the garden of a member of NatSCA! ), and has since spread outward and upward to colonise the UK. In February of this year it was recorded in Shetland, completing its northerly journey in only 8 years. 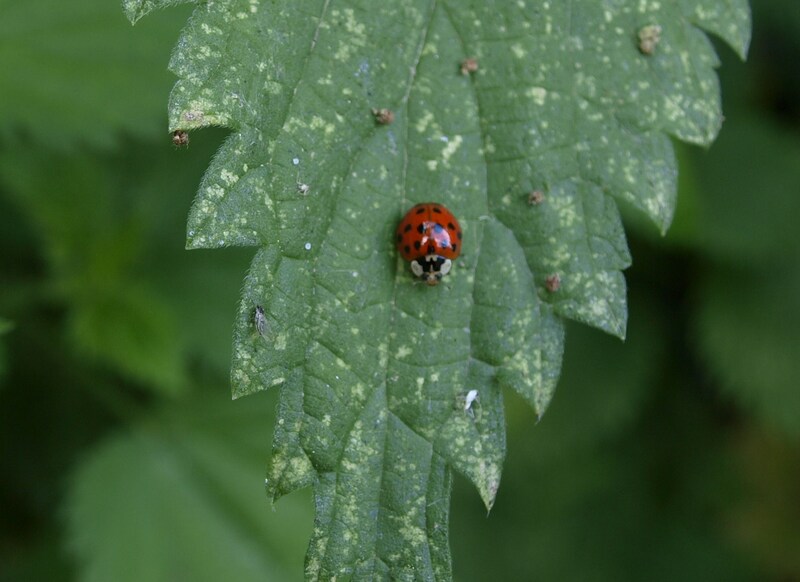 Harlequins are predators; they both out-compete native ladybirds for food, and also eat them if their usual prey – aphids and scale insects – becomes scarce. 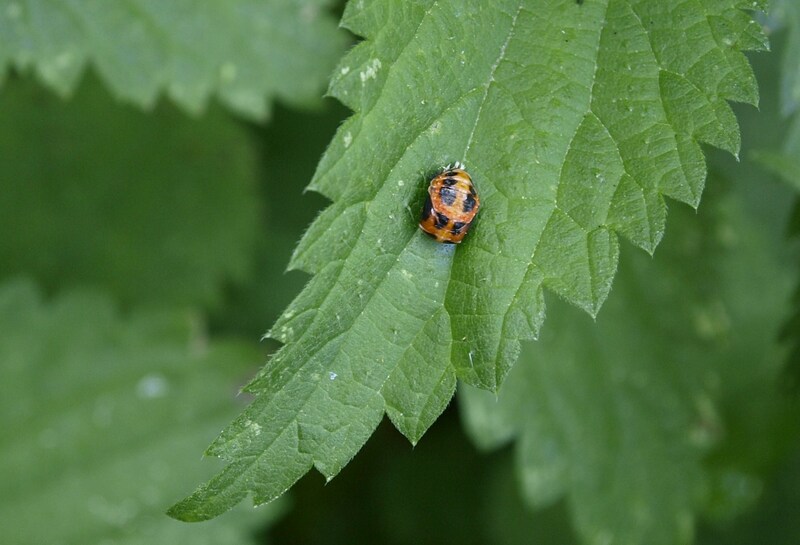 A recent study, which utilised public sightings of ladybirds reported to the UK Ladybird Survey, identified a dramatic decline in the populations of native ladybird species since the harlequin arrived, particularly the 2-spot ladybird (Adalia bipunctata), which had declined by 44% within five years of the harlequin reaching our shores. Yep, harlequin larvae, pupae and adults. The full set. 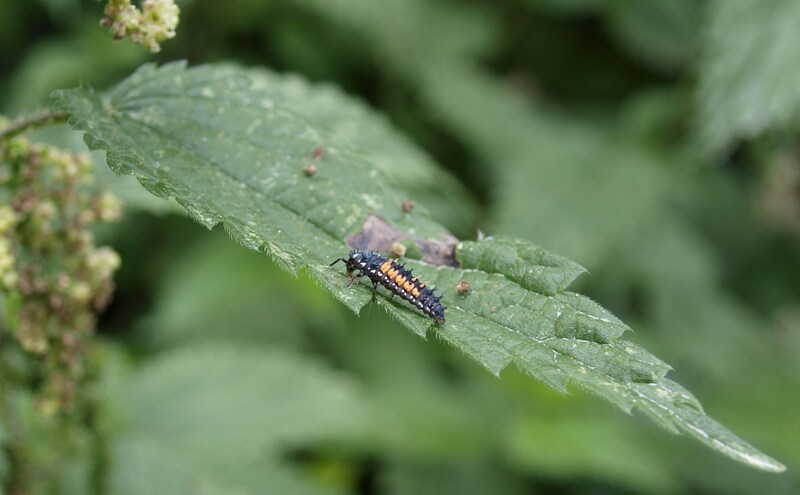 I instantly recognised the larvae as harlequins, as they are very distinctive with the orange stripes down their sides, and a brief internet search confirmed that the pupae and adults were also harlequins. The adults are harder to identify from a casual glance, as they are extremely variable in appearance. They are recognisable by their large size (although this is hard to judge without another ladybird sitting next to them for comparison! ), and the patterning on the pronotum (the ‘neck’, if you like, between the head and wing cases). The pictures on this handy website are very useful for comparison with other species. So, what do you think I should do with my little garden invaders? Should harlequins be exterminated one at a time, or is it now too little too late? How should invasive species be controlled (or even prevented from arriving in the first place)?